Jim Thompson died peacefully in his sleep on August 22, 2018, in Portland, Oregon, at age 96. Jim was born in Coshocton, Ohio, on November 15, 1921, to John Thompson and Jessie (McCluggage) Thompson. He was preceded in death by his parents, his wife Lois, son Steven, and sisters Roberta Ashcraft, Lois Fox, and Mary Cox. Jim loved Coshocton and Ohio history and could tell colorful stories about his childhood and college years. He played clarinet and saxophone in school and community orchestras and in swing era dance bands. He loved Benny Goodman and Glenn Miller tunes all his life. He received his undergraduate degree from the College of Wooster, then began graduate studies in mathematics at Brown University. He completed his Ph.D. at the University of Minnesota-Minneapolis and went on to teach math there for 40 years. He met Lois, his “Kansas sunflower,” in Minneapolis, was married there in 1948, and lived in Minneapolis most of the rest of his life. He loved exploring the parks and backroads of Minnesota, binoculars in hand to look for birds. 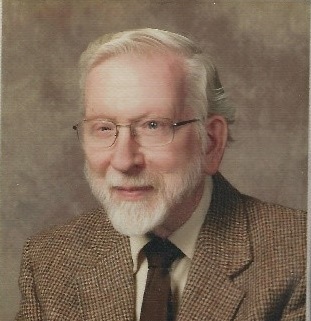 He and Lois were archivists at their church, Plymouth Congregational in Minneapolis. Plymouth’s “King-Thompson Archives” is named to honor them. Jim was a kind and supportive father and grandfather. He moved to Portland in 2013 to be closer to family. Jim is survived by four of his children, David Thompson (Ingrid Holmlund), Seattle; Janice Thompson (Madelyn Elder), Portland; Nancy Thompson (Lee Galloway), Waynesville, NC; Gordon Thompson (Amy Livingstone), Springfield, OH; and four grandchildren, Julia, Joel, Samuel, and William. Private interment will be in Minneapolis. Memorials may be made to Plymouth Congregational Church, 1900 Nicollet Avenue, Minneapolis, MN, 55403-3789, or to your charity of choice.